In practice the cost of such a product currently remains somewhat higher per kilowatt hour of electricity over the lifetime of the unit than does a system where the solar cells are fitted on top of an already existing roof. The National Renewable Energy Laboratory is working on making those products less expensive, yet retaining their efficiency, to make them easier to deploy and minimising the number of tradespeople who have to interact in order to install them. 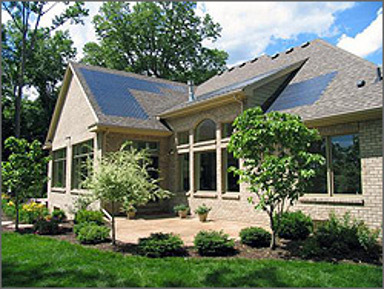 An example of a product that is in widespread use now is a solar roof tile. In some places like California, the construction of new homes often involves the use of a tile styled roof, and there are now a number of commercial products where a photovoltaic roof tile can be used to replace a conventional roof tile on a one-to-one basis. This is the kind of integrated building device which is beginning to become more popular as people recognise it as a familiar-looking building element. In a neighborhood where there may be aesthetic considerations and covenants which are in place with the desire to keep a uniformed look and feel to a new development, those photovoltaic tiles make it easier to do that. There are thin film roof shingles that also simply replace a typical composite asphalt shingle of the sort that is used in new construction, particularly in the Midwest and North East of the USA. These are typically based on a thin film photovoltaic that has a somewhat lower efficiency than what is commercially possible. A lot of these are being deployed in new buildings. New constructions are, however, only a tiny fraction of the total overall housing population. A lot of people already own their homes and are trying to figure out what to do to make solar energy a possibility for themselves. The National Renewable Energy Laboratory is therefore also interested in how something that may not exactly replace the skin of a building but instead is nearly-integrated, yet may have the apearance of being more integrated, for retrofitting onto already existing buildings. Increasingly more products are being developed and made available based on conventional photovoltaic technology with crystalline silicon, which is the most common material used as the semiconductor. This looks more similar in color to many standard roof materials, so that when they are installed they do not look out of place. Many people prefer this because although they may be interested in the new solar power technolgy, they may not want to look at a photovoltaic panel sitting on the top of their house. These products are much more readily available nowadays, and "systems integrators" are available as solar energy becomes more attractive to different markets around the USA and other parts of the world as a result of local or national legislation which incentivises people to use it. If people can add solar power to their own existing house using a certified installer rather than a new development, which is just limited to a few people who are in the market for a brand new home, then solar power gets into the hands of far more homeowners. Cecile Warner who is a Project Manager at The National Renewable Energy Laboratory is herself such a homeowner. She has lived in a solar powered house since around 1985, and bought her house before building-integrated solar energy products were available. She has had a solar energy system added on to the roof of her house, which is used for electricity in her own home and also in her neighbors' houses too. For her home is a place that has fabulous day lighting and is a modest space, accommodating the people who live there without having a lot of unused rooms. She describes it as being a delight to wake up in and a place that makes you feel alive and engaged, being surrounded by good materials and intersting forms and shapes. She believes that anyone who has ever woken up in a solar house with a passive design and good architecture knows that there is something special about a home that can power and light itself. There is often a human tendency to overlook the way that nature still controls our modern lives, and being more connected to the coming weather and the environment is something that is a gift from a solar powered home. As an energy insider, Cecile has already done a lot of things to make her home relatively energy efficient during the construction process, so her energy requirement are not huge, and her electric bill is relatively modest. She has a 2 kilowatt photovoltaic system installed on the roof, which meets 100% of her electricity requrements over the course of a year. There are times when her actual immediate usage is higher than what her solar cells are generating at that particular moment, particularly at night, and there are also times when the cells generate more that her immediate usage, but on balance over the course of a year the usage and generation balances to just about even. The neighbors don't mind the way it looks which is also a bonus. To sell electricity back to the power grid, there is a single meter which operates in both directions. Each US municipality, jurisdictiona and utility company may have its own different way that they like to deal with people producing their own power but in Colorado, for example, where Cecile lives there are metering laws in place which mean that if a legitimate system is connected to the grid the energy company will buy what is generated by her system and she only needs to pay for the difference between what the energy company provides for her and what she provides for them.